The second I dug this recipe out I knew it was old, I also had every ingredient on hand. I'm mentally placing this in the cake category, it's definitely a dessert... although if you ate it for breakfast I wouldn't judge you. The only problem... the baking directions freaked me out. Just looking a the recipe you'd think it was a chocolate filling type of cinnamon roll. The dough was insanely easy, and the recipe was also a snap to cut in half. Which is important when there are only two of you. So what freaked me out so much about such a simple recipe? It called for boiling water to be poured over the rolls before baking. I didn't recall seeing this recipe anywhere before, so I had to google the method to make sure I wasn't about to destroy this recipe. Turns out... it's an old Southern thing. So I bit the bullet, put all my rolls in the same pan (the original plan was to bake half this way and the other half the cinnamon roll way), put some water in the kettle, and poured hot water over my pretty little rolls. Preheat oven to 350. Mix Pioneer Baking Mix and milk in a bowl until it forms a dough. Roll out onto a floured surface and knead 3-4 times. Next, roll out dough into a large rectangle. In a separate bowl, mix sugar and cocoa powder with enough butter to form a paste. Smear chocolate paste mixture onto the rolled out dough. 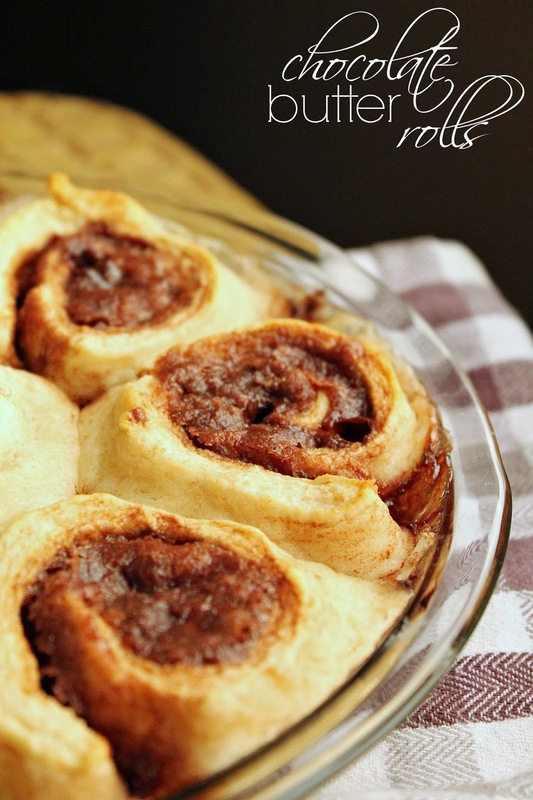 Roll dough like you would a Jelly Roll and cut into 1 inch pieces. In a greased pie plate, or baking dish, place chocolate rolls. Cover rolls, nearly to the top edge, with boiling water. Bake for 30 minutes. I almost made a sauce for them, until I noticed that the water had created an amazing chocolate sauce. This chocolate sauce seriously reminds me of my grandmother's chocolate gravy. To serve you can either turn the pan over allowing the sauce to glaze the top, or just scoop out the rolls and sauce from the pan. You can tell what I did. It seriously took everything in me to not sit there and just devour the sauce. If you not only like old recipes, you love old recipes cards... I made one up just for you. 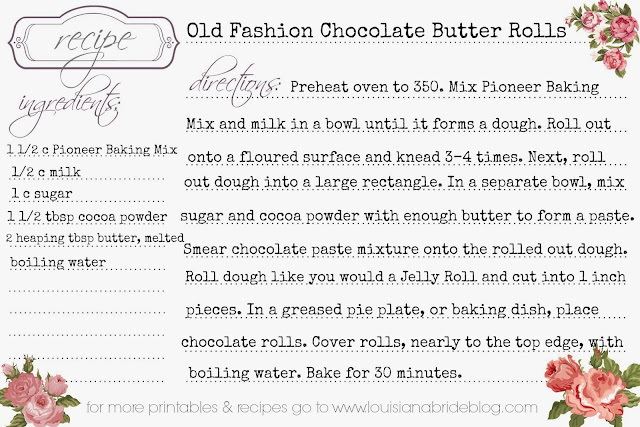 Recipe card made using Royale feature from PicMonkey.